5.You have to check to see when it’s done. After a few days, the bright green will turn to yellow and brown. If you look closely, you can still see some bright green. Wait until all of it turns brown. Now you can taste it by using a clean chopstick. Every time you open the jar, top with a spoon of vinegar before closing it. You can also add water if the water level has dropped. If the mustard greens don’t taste like they are pickling by day 6, you probably didn’t use enough salt. Add more and turn the jar upside down a few times. 6. When it’s done (to your taste), remove the leaves from the water and store in tupperware, in the fridge. 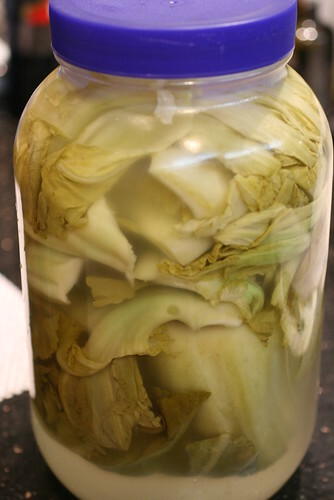 *Note: Water can be re-used to pickle more mustard greens. Just pack in the leaves and sprinkle a little more salt and top with vinegar again. I LOVE Swan Tsai, sour and salty, crunchy and crispy, ok, they are an ugly color, but it’s so so good! The anticipation while it’s pickling is what kills me so start making more before you finish your stash. posted by jessica	at 08:30 AM	Filed under Chinese, Recipes. You can follow any responses to this entry through the RSS 2.0 feed. Both comments and pings are currently closed. Thanks for the recipe. This looks very tasty. Interesting! I always wondered what that “Stuff” in the soup was! It’s delicious! Kelley, it is so delicious, yet so simple. Lindsay, don’t you love nostalgic foods? I honestly always thought this was more laborious than it actually is–thanks for the recipe!! Dr. Food, I did too. I’m never buying the store-prepared ones again. It’s just too easy. 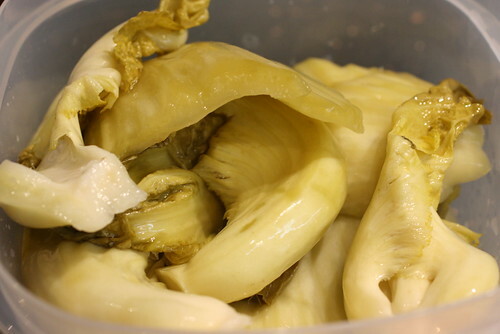 We’re still not too confident with pickling and such… but this sounds like a must-try! TS, this is too easy to pass up. We’ve been holding off making our own version of Taiwanese beef noodle because we can’t figure out what the greens were. We’ve asked around and nobody seems to know. So, is it, is it, is it really? JS, it is!! It’s the best stuff ever right? Beef Noodle Soup is not the same without Swan Tsai! Wow, I’ve never considered my own swan tsai, but you make it sound so easy that I just might try it. Thanks! gaga, I know it sounds to easy to be true but it is! i think i used the wrong kind of mustard greens – they only had one kind at my farmer’s market! they haven’t lost their bright green color yet. i might just rinse and cook those and go back to the drawing board! Al, does the mustard green you got look different? Did you use enough salt….it’s quite a lot. I bought pickled mustard today, and am having it with fried chicken tonight, but I’m wondering if it’s best served cold or warm. Morty, I personally think it’s good at every temperature. I’ve had it in soups, sauteed, chopped up as a relish cold, all delicious. Thanks so, so, so, so much! 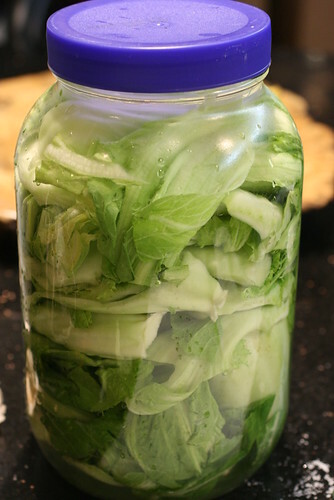 My mother used to pickle her own in Vietnam but now she can’t quite remember how she did it. We experimented a few times but it turned moldy before it was edible. I am definitely giving this a try. Our family loves the stuff but it is harder and harder to buy it without all the food colouring, sulphites and msg. So a big thanks to you and your mom from me and my mom. orchidpavillion, awesome! Let me know how it goes! Would these turn out sour? Yummyum, these are supposed to be sour. The process turns them sour and the 1 tablespoon of vinegar is really just to prevent mold. How much salt do you use per pound of mustard greens? Thanks for the reply. I’ll give that a shot. Bob, there’s no exact measurement for this because it will vary depending on water and the temperature. The process Roy describes is a bit different, maybe a Japanese style of pickling. Thank you . I have been looking every where for this. Now I start the search for spicy preserved oriental Cucumbers. I wonder how different the Chinese Mustard Green from the Mustard Greens we grow here in the south? I bet this recipe would be good with Turnip greens too. I’ll have to try that out and let you know. Allen, I’d love to know!! Take pics! I think that any cruciferous vegetable greens (including rutabaga, turnips, kohlrabi, cabbage, kale, cauliflower, broccoli, Brussel sprouts, gai-lan, mustard, rapeseed) will work, though some better than others. They’re all related plants, and i’ve eaten pickles made from greens of turnip, mustard, and kai-lan [“chinese broccoli”] so they should work. How long does it last in the fridge after you take it out of the jar? Thanks again! I couldn’t find it in my market today and I wanted to make my own to use for other foods. Sara, at least a week, maybe 2. It’ll depend a bit on how often you open the container in the fridge.